« Did June Cleaver ever say “No”? 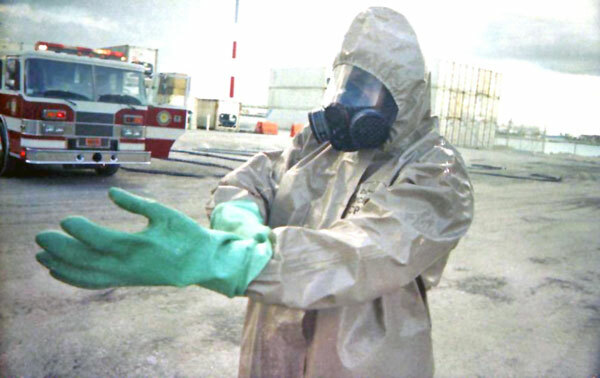 Does this Haz Mat suit make me look fat? Without much warning, Jack threw up. It was vomit of the projectile kind. If you are a parent, you know what I’m talking about. It was the kind of thing that rivaled Linda Blair in the Exorcist. There we were at 2 a.m., cleaning our carpet, cleaning Jack, and cleaning our bed. Jack later fell asleep. Mommy and Daddy did not. I think we were too freaked out. Later today, Jack took a nap and is now feeling better. You’d think that was the end of that, right? NOPE. I picked Will up from school, made him a turkey sandwich, and unloaded the dishwasher while he ate. Suddenly (without any warning) Will said, “Mommy, I feel sick!” Of course, only two seconds elapsed before Will had vomited all over the kitchen table, the cabinets…and me. That makes twice within 24 hours that I was covered in vomit. It was official. The stomach virus that I just knew my kids had escaped had made it’s way to my house. Seven out of sixteen children had been absent from Will’s prekindergarten class on Friday. I thought we had missed the bug. Well, no such luck. This is when I decided that I desparately need a HazMat suit. I could not be any more serious. I really, really, really need a government issued HazMat suit! As a stay-at-home mom to three little boys, I am solely responsible for “sick days.” As part of the “deal” that my husband and I worked out when I decided to leave the workplace, I was to take care of my children if they could not go to school. This arrangement was to free up my husband to keep his career going. Plus, I wanted to be with my children when they got sick. I never liked the idea of leaving them with someone else when they needed me. I actually want to care for them, rub their backs, make soup, etc. I don’t like to be away from them when they look so puny. Most Mamas feel like this way. I’m sure of it. However, wouldn’t it be nice to just put on one of those big, hulking, HazMat suits…pour bleach on the floor… and clean the illnesses away? You may think I’m obsessive compulsive, but I’m not. I just know that when you’ve got a virus running rampant, you’ve got to clean…and you’ve got to do it well. If not, everyone suffers. I also want one of those suits, because I really can’t afford to get sick myself. Who takes care of Mommy when she gets the stomach bug? Well, there’s no such thing as doctors who make house calls around here, sister. I’m on my own. I’ve got to stay healthy. Therefore, I’m in search of one of these suits, but where to find one? What would the neighbors say? Could I go to the grocery store in one of those things? Could I wear cute shoes with it or would I need to wear matching HazMat boots? …and I just wonder…would a HazMat suit make me look fat? hmmmmm.